Watch me read the Introduction of my new book, which is available for order right NOW! Order the book today and receive amazing bonus gifts. You can purchase the book anywhere books are sold or click one of these quick links to buy the book/ebook. and head back to this page. Submit the form below to get the video speakers series and the bonuses. They’re FREE when you order Colette’s new book, Uncharted (published 01.09.18). This bonus playbook (PDF) brings you all of the Uncharted exercises into one easy and manageable place. As you read Uncharted and begin uncovering your co-creative rhythm, this workbook will help you go through the powerful, life changing exercises one by one. Spirit wants you to play- not work so hard at co-creating! As an UNCHARTED Spiritual traveller, we’re going to give you a meditation package that will be the complement to Uncharted’s teachings. If you’ve watched any of the videos about uncharted, Colette has brought up many aspects of her book that cover various realms of co-creating with Spirit as your partner and source of your supply. 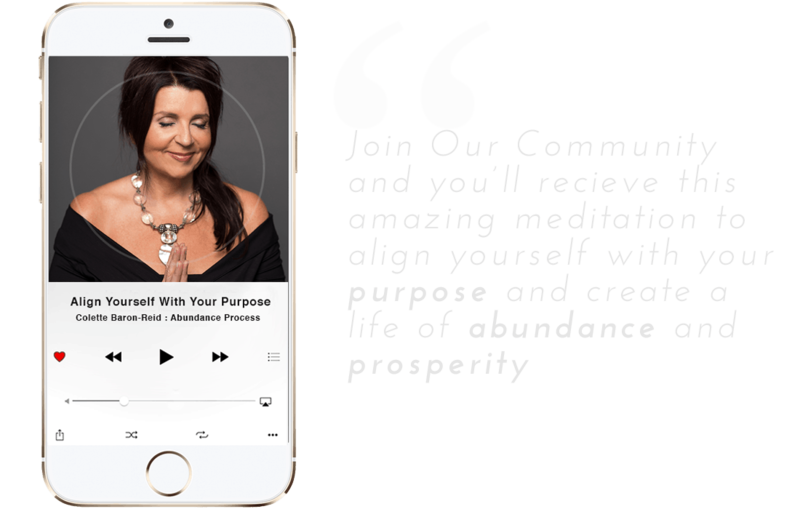 These meditations will help you break free of limiting beliefs, patterns and road blocks. And align you with Spirit to forge a co-creative partnership that enables you to go beyond the world of form to co-create your vision for an emotionally fulfilling life that will be beyond wildest dreams. Get access to an incredible video series of conversations between Colette, and thought leaders in their respective fields, who discuss topics ranging from “the deep meaning of science and spirit” to “how the mind and meditation can heal”. These are Real and Raw conversations with highly respected authors and mentors, such as Dr. Joe Dispenza, Gregg Braden, Denise Linn and Danielle Laporte to name a few. You won’t want to miss these informative and inspiring conversations. You will also get a reflection journal as a companion with topic points and space to take notes as you listen to each video. If uncertainty has become your new normal, you need a new map! In a swiftly changing world, as uncertainty has become the new normal, most of us don’t know the answers. How will you find the peace, prosperity, love, and abundance you seek? How can you get grounded to manifest your desires when it feels like you’re walking on shifting sands? Is it even possible to have the life you desire? All of this can be really overwhelming. Right? Listen up. Right now, you’re being called to an adventure! And you have to be brave and sail into uncharted waters—away from the old familiar ways that don’t work anymore—so you can discover your true self and the infinite potential for your life. Even if it’s scary to leave familiar shores, if you want that amazing life you just know is waiting for you, you have to move away from an outdated worldview of separation, scarcity, and competition. Take a moment to imagine how that will feel when you can do that and your eyes open mid leap to the magic of a profound collaboration – an anchor tethering you to the truth that everything is interconnected and Spirit is the source of your supply. This is the real truth: It’s in the as-yet-undiscovered places within you that you will come to recognize what you can be- and your power to co-create and manifest when you discover Spirit as your partner. If you try to create guided only by the old, familiar map of your life, you won’t get very far. You need a different kind of map—not one that tells you where you’ve been, (and what everybody already knows) but one you can always trust that reveals itself as each new experience awakens the miracle maker in you. It is in the uncharted waters, during uncertain times, when you feel most lost that you actually have the greatest opportunity to begin manifesting the life you desire. And this opportunity exists because your authentic nature is spirit, containing the essence of Spirit, and you are already a powerful co-creator—you just forgot that! (or maybe nobody told you?). So lets say you visualized, tapped, meditated, and created a vision board, but you’re not where you want to be—I get it. The world seems to get more overwhelming all the time it’s hard to remember how to trust that your most cherished dreams can become reality. You tried to make your life better and it seemed to get worse. You tried harder than you ever had to co-create a better reality and what you got was the same old, same old. You thought you listened to your intuition but it cost you money, heartache, and lots of hard work and time. Maybe you got everything you asked for and it turns out it wasn’t what you wanted! I’ve been there too, years ago my life was in shambles, and I had lost everything but when I hit bottom I had a spiritual awakening. Miracles and synchronicity opened up and the most extraordinary things happened for me yet sometimes I still fell asleep at the wheel. I didn’t understand why, and I longed for something I couldn’t put my finger on. Now I know what that something was! I forgot Spirit was my partner all along and I needed to feel that connection because when I do everything falls into place. All this has led me to discover something extraordinary about how Spirit helps us co-create reality. Let me teach you the secrets of the art of co-creation. Here’s what you might not know: It’s not just the woo woo people! The greatest minds in the frontiers of science have agreed that our world is unified, that the nature of reality is a living energy and consciousness that is collaborative, connected, and harmonious—the exact opposite of all we have been taught. And, we are not separate from Spirit, having to go it alone. We’ve been tripped up by our misperception that we have to do it all ourselves, and compete for limited resources. No, no, no! This world is more magical than you and I could ever dream of! The most potent change you can make is a shift in awareness. There is a greater self within you that always has access to unlimited resources. And you always know when you’ve tuned in to it! Think of all the synchronistic moments you couldn’t possibly have planned. You didn’t do that by yourself! And none of those unplanned amazing moments were ever on the familiar map you’ve been following. It’s time to take the blinders off. Come with me into Uncharted and take a symbolic journey, reveal the map of your soul, and abundance, confidence, and courage will be yours. The storms can leave you laughing in the wind as you sail forth on an adventure of self-evolution. And your self-evolution is necessary—for all our sakes—because what you have to offer is extraordinary. Your light matters! the Realm of Form, where you will delight in seeing the results of your self-evolution manifested in the material world. Love, purpose, prosperity, and joy—they are all there, waiting for all of us to claim them! if you did what you’ve always done you’ll get what you’ve always gotten, so be bold! Sail into the uncharted waters. Trust that whatever you desire, you are worthy of it. Harness your personal power and venture into the uncharted, where magic happens! Colette Baron-Reid is an internationally acclaimed psychic medium, and star of the national hit Canadian TV show Messages From Spirit. She’s an oracle expert, and best selling inspirational author published in 27 languages. She is a popular keynote speaker, music recording artist, and entrepreneur. Voted into the prestigious Watkins list as one of the top 100 most spiritually influential people in 2013 and 2014, Baron-Reid delivers her message of perspective and hope with her trademarked compassionate candor and hilarious personality. Known by her clients as “The Oracle”, her reputation for her laser sharp intuitive insights is worldwide with a client base spanning 29 countries. She is the founder of the Master Intuitive Coach® Institute, CEO and founder of The Invision Project and The Invision Lab offering advisory services for select influencers, and education for coaches in her trademarked energy psychology technique The Invision Process®. Originally from Toronto, she splits her time between the USA and Canada with her husband and 3 pomeranians. When she’s not writing books, talking to dead people on TV and teaching global audiences she’s riding her Harley on the seacoast.